The sounds in the Cuyonon language can, for the most part, be written quite simply, and (in contrast to the English language!) in ways that are easy to read. Here is a start at describing this system. We recognize that there will be areas we have not addressed, and so we solicit your questions and comments. Remember that we are writing our own language, Cuyonon, not Tagalog, or English, or Hiligaynon, or Spanish. So we must think in terms of the Cuyonon language itself, and not utilize patterns we have seen in other languages unless they fit the structure and sound system of Cuyonon. 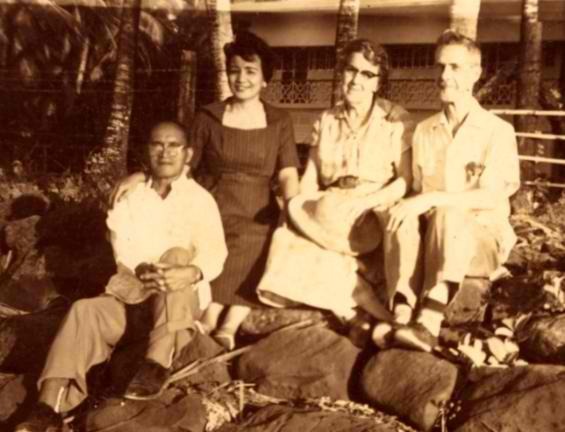 Dr. and Mrs. Colin Tweddell (at right) and Cuyonon informants. Dr. Tweddell was the first linguist to study Cuyonon. He collected texts by interviewing native speakers and compiled an extensive Cuyonon vocabulary. He quickly established rapport with the Cuyonons by learning to speak the language in a matter of months. He was thorough and dedicated, paving the way for subsequent, more extensive studies of the language. and ‘ (glottal stop written as an apostrophe). Please note that ng is a single sound. – that is, two vowels found together. referring to a castrated rooster). In speech, the two identical vowels (aa) are pronounced as one long vowel. As in all languages, we find in Cuyonon action words (verbs), object and instrument words (nouns), actor words (nouns, pronouns,), descriptives (adjectives, adverbs), etc. Verbs tend to be made up of root words (for example, balik) and affixes that precede the verb (prefixes), follow the verb (suffixes), or are inserted within it (infixes). For example, nagabalik has the prefix naga-; balikan has the suffix –an; and baralik has the infix –ar-. Many nouns are made up the same way. For example, pagbaraliken has the prefix pag-, the infix –ar-, and the suffix –en. The affixes are always attached to the root word, not written separately. Sometimes, too, the root is reduplicated, as in nagabalik-balik or agabalik-balik. The choice between O and W, and between I and Y, depends on where they occur in a word. W and Y are called semi-vowels, because sometimes they serve as consonants: (e.g., wala, to the left, left-handed; yaya, nanny). Moreover, at the “edges” of syllables these sounds also act like consonants and are therefore also spelled with W and Y – e.g., karabaw, bakaw, tatay, engey. In the middle of syllables the sounds are vowels and are therefore spelled with O and I – e.g., rokrok, bitbit. There are also many Cuyonon words in which the O or I sound follows a consonant, and is then followed by another vowel. In these cases they are neither on the “edges” of syllables nor are they in the middle. These are called “off-glides” because they “slide” off the first consonant, and they are spelled with O (as in boi, boin) and with I (as in sipilio, siansi). To understand why O and I should be used in these situations, form the future of the verbs boat and siak: you will see that Cuyonons duplicate the first consonant and the first vowel and boat becomes boboaten, and siak becomes sisiaken. If we were to use the W or Y, the future forms would be bwabwaten and syasyaken, which are not Cuyonon words. This is a catch in the throat common in Cuyonon, causing a short break in the flow of speech. Cuyonon speakers are often unaware of the glottal stop but they must become aware if they want to write their language accurately. It can appear in the beginning of words that start with a vowel, in the middle of words, and at the end of words after a vowel or a combination of vowels. When the glottal stop is indicated by a written symbol, that symbol is the apostrophe (‘). In isolation (that is, not in a phrase or sentence), the glottal stop before the initial vowel is pronounced, but in the middle of a phrase it often is not. For example, the initial glottal stop is pronounced when the word ambeng is used alone, but in the phrase ang ambeng digi sa balay the glottal stop is frequently dropped. Therefore, the initial glottal stop is never written. In the middle of words, the glottal stop usually occurs after a vowel and before a consonant or another vowel. For example, be’ras, e’en. Sometimes the glottal stop substitutes for t or d in the middle of a word or phrase. For instance, itlog becomes i’log, betken becomes be’ken, tolad i’ dia becomes tola’ dia, or even toa’ dia.In this in-between position the glottal stop must be written; e.g.,te’me, kira’bot. At the end of words, glottal stops frequently occur; e.g., bai’, great-grandmother. Note, however, that when the ligature ng is added to such words, as in the phrase baing Maria, the glottal stop disappears. It also disappears in the first half of a reduplication, as when bata’, child becomes bata-bata’, doll. Glottal stop (‘) in the i’ ang construction. To indicate the agent of an action when the agent is not in focus. To indicate possession. Ang balay i’ ang manggaden mabael. must be written as an apostrophe. Manga – This word should be spelled out (not spelled mga as in Tagalog). bata’, ara’, tio’. We don’t write the glottal stop. Demonstratives – digi, didi, daya, doto, dotia, dia, dato, etc. 5. Ni or i should be written as they are spoken. If you wish, my father’s autobiography has a chapter on the Cuyonon NT translation.